Quiche is one of our favorite breakfast treats. 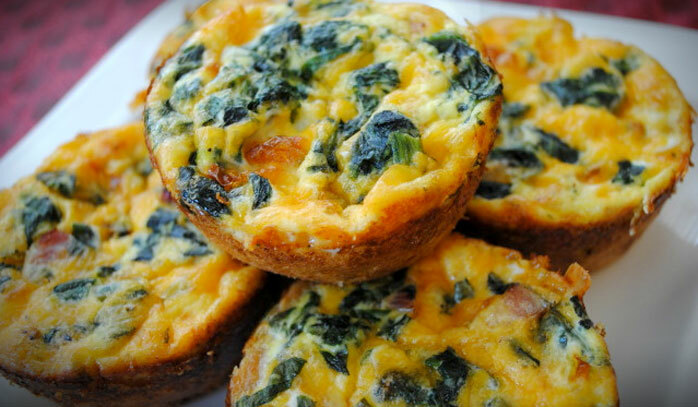 Mini-quiche are even better -- beautiful, poppable and packed with flavor. These are fantastic for brunch, a breakfast party, or to make in advance for an on-the-go breakfast or snack option. *Alternate ingredients - If you don't care for mushrooms, try asparagus or bell peppers with the spinach, or add some onions to the mix. 2. Heat oil in a large skillet. Saute the mushrooms until they are soft, approximately 6 minutes. Set mushrooms aside. 3. Place spinach in skillet used for the mushrooms. Add 1/4 cup water. Using medium heat, cook the spinach just until wilted, approximately 3-4 mins. Use either your hand or a spatula to pack in the spinach. Drain the excess water extremely well. 4. Whisk the eggs in a large mixing bowl. Add the cooked mushrooms, spinach, cheeses and cream (optional) to the eggs. 5. Mix well. Season to taste. 6. Divide evenly in a 10-12 cup muffin tray. 7. Bake for approximately 22-23 minutes at 365 degrees, or until well set and a tester/toothpick inserted in the center comes out clean. 8. After cooking, remove from the oven and let sit for 3-4 minutes. 9. Sprinkle with a little more cheese on top, if desired (we heart cheese). 10. At this point, each quiche should easily remove from the pan. 11. Serve with rice or fruit on the side. 1. Spinach is loaded with flavonoids which act as antioxidants, protecting the body from free radicals. Researchers have discovered at least 13 different flavonoid compounds that act as anti-cancer substances. 2. Spinach is a heart-healthy food. It’s an outstanding source of vitamins C and A, which are antioxidants that help reduce free radical amounts in the body. The antioxidants work to keep cholesterol from oxidizing. In addition, folate is good for a healthy cardiovascular system, as well as magnesium, a mineral that helps to lower high blood pressure. 3. Spinach is an excellent source of iron. This mineral is particularly important for menstruating women and growing children and adolescents. Plus, spinach provides a lot less calories than red meat, and is fat and cholesterol free. 4. Gastrointestinal health can be guarded by eating more spinach. The beta-carotene and vitamin C in spinach work to protect the cells of the body’s colon from the harmful effects of free radicals. 5. Some conditions that are identified as inflammatory, such as arthritis, osteoporosis, migraine headaches, and asthma, may be helped because of the anti-inflammatory properties of some of the nutrients found in spinach. 6. Lutein is a carotenoid found in spinach that is protective against eye diseases such as age-related cataracts and macular degeneration. There is some indication that it might be absorbed better if you eat it with a little fat, such as a small amount of olive oil -- or eggs!